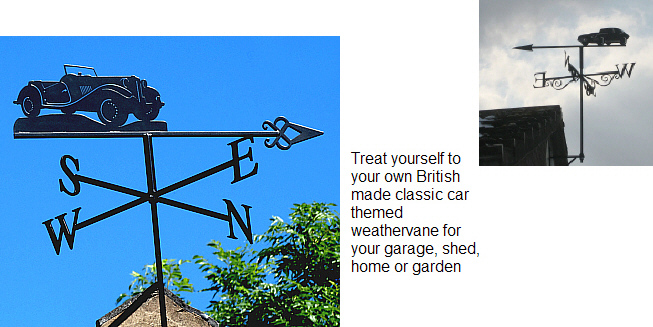 A fine selection of beautifully sculptured British made weathervanes available in four sizes. Small: Measures approximately 46 cm across the cardinal points (north - south or east - west), and will suit a shed, garage or summer house. Medium: (Most popular) Measures approximately 61 cm across the cardinal points and is designed for a larger building, such as a standard size house or larger garage or shed. Large: Measures approximately 76 cms across the cardinal points and is made to be highly prominent on a larger size building. Extra large: Measures approximately 102 cms across the cardinal points and is intended for significantly large buildings, such as manor houses. sculptors and metalworkers using the finest materials available. They are then electroplated with zinc at the end of the production process to produce both a smart matte black finish, as well as reduce the chance of rust or other defects during a long life outdoors. 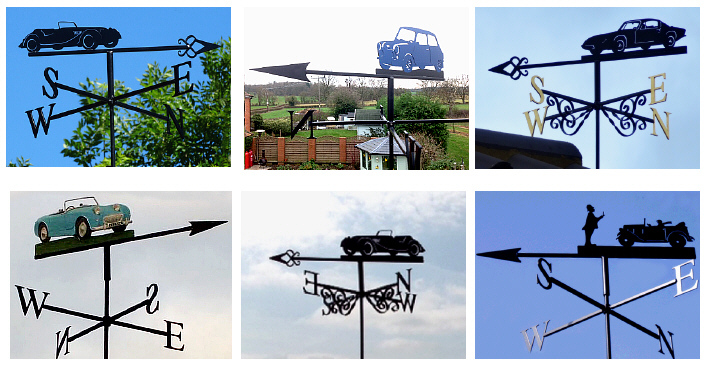 In advance of despatch, each weathervane is then balanced and tested to ensure it will be instantly functional once it has been installed. A long-lasting functional gift which will impress all your visitors. All fixtures and assembly instructions are supplied as standard.